Often times, the only way to get exactly what you want in a device is to just build it yourself. Well, maybe not the only way, but we’ve all certainly told ourselves it was the only way enough that it might as well be true. We don’t know if the DIY imperative felt by [Olav Vatne] to construct his own Bluetooth mechanical number pad was genuine or self-imposed, but in either event, we’re glad he documented the process for our viewing pleasure. Broken up into three separate posts on his blog, the construction of his custom numpad starts innocently enough with buying a kit from AliExpress. In a rather bizarre twist, the kit arrived assembled, which lead to an arduous period of desoldering to separate all the principle parts [Olav] wanted in the first place. So much for saving time. Once he freed all the mechanical keys from the kit’s PCB, he went to town hand-wiring the matrix. After testing to make sure all the keys were wired correctly, the matrix got connected to an Adafruit Feather 32u4 Bluefruit. With the electronics sorted, [Olav] moved on to the software side. Here he was able to accomplish one of his primary goals, having a numpad that works over both USB and Bluetooth. The last step of the process was creating the wooden enclosure. It basically goes together like a picture frame, with special care given to make sure there are appropriate openings in the case for the switches and USB port to pop through without ruining the overall look of the device. Thanks to cheap USB-capable microcontrollers, hand-made artisan keyboards are now a thing. This project is a nice way to get started with custom input devices, and it only gets better from here. The form factor of this keyboard just doesn’t look right. What’s missing? Oh, the numpad has been completely removed! We use our numpad almost exclusively (especially when coding) so it’s a little hard to figure out why [Ludw] did this. His only mention of motive is that he wanted the mouse closer to the main part of the keyboard and that he didn’t use the numpad. No matter what the reason, we still think he did an amazing job of giving new life to the older keyboard. It started out as a plain old beige Cherry G80-3000 keyboard. After cracking open the case [Ludw] carefully traced out the connections between the key matrix and the PCB which provides the USB connection. This is because the controller is mounted over on the part of the PCB he his about to remove. Before making the cuts he desoldered all seventeen switches (these can be reused to fabricate a new keyboard, or add switches to various projects). 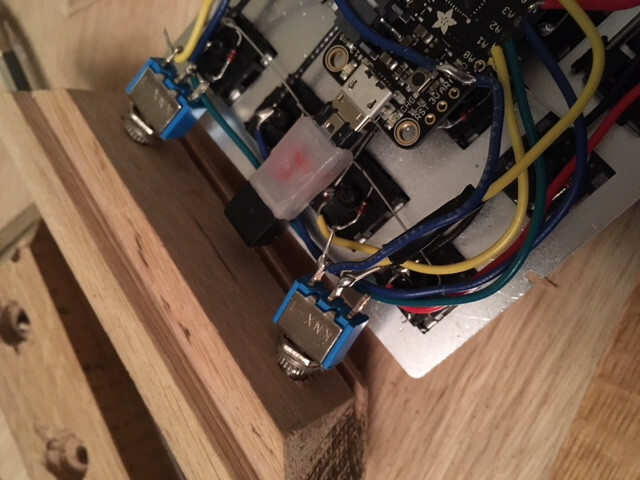 He then lopped off the depopulated substrate and used point-to-point soldering to reconnect the controller. A bit of case alteration removed the extra space while also reusing the nicely molded edges. A clean and tidy paint job finishes the hack. We have to agree with NYCResistor, the exclusion of numeric pads from laptops is a real loss for productivity. Ever try to working with a huge spreadsheet ledger without a 10-key? Sure, there are usually function key alternatives hiding somewhere on those reduced keyboards. But that’s hardly the same thing. We think it’s time to take back the numpad. This project shows you how easy it is by using some old time lab equipment to replace the missing keys. They’re using a Teensy microcontroller board to translate the key matrix into USB inputs. Most of the work is already done for you because of the USB HID Keyboard library available for the development board. 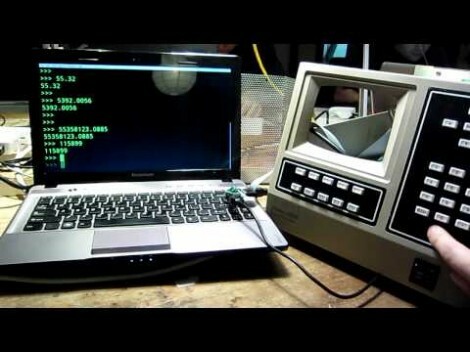 Scanning your own key matrix, or decoding the buttons from some rad hardware like this Walters 600E is up to you. A demo of the rig in action can be found after the jump. Is there anyone else who wishes the 10-key had an ‘X’ on it for coding hex values? Perhaps that will be a future project for us.